I am now officially a professional stage director. 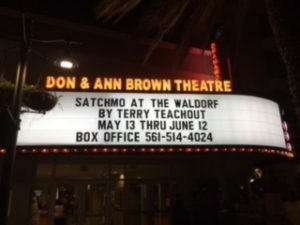 My new production of Satchmo at the Waldorf, my first play, opened on Friday at Palm Beach Dramaworks, where it will run through June 12. Mrs. T and I flew out of West Palm Beach first thing Sunday morning. By midday we were back home in New York, having said our farewells to Satchmo and all our new friends. 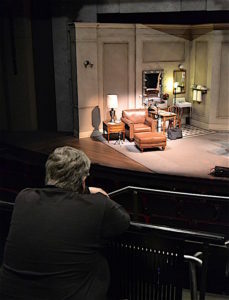 I walked toward Once in a Lifetime for the last time—that final walk every playwright takes toward his play, knowing that it is no longer his, that it belongs to the actors and the audience now, that a part of himself is to be judged by strangers and that he can only watch it as a stranger himself. After three and a half weeks of intensive rehearsal and two public previews, the production, for better or worse, slipped out of my hands on opening night. The hard-earned, well-deserved standing ovation that Barry Shabaka Henley received at the end of the evening was the visible sign that its ownership had been permanently transferred: Satchmo now belongs to Shabaka and the members of the stage crew that will put it on for the next month, after which the show will vanish forevermore into the memories of those who saw it. As for me, I poured myself unstintingly into my debut, and I relished every part of the experience, just as I was, and am, deeply proud of the production that resulted. 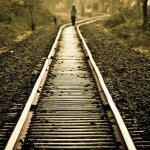 It scarcely seems possible that I’ll never see it again—yet I know I won’t. Even if I should someday direct another production of Satchmo, it won’t be anything like this one. Such, if I may rip a famous phrase out of a radically different context, is the evanescent nature of theater: all that is solid melts into air. 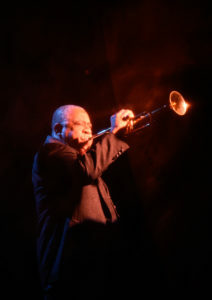 Looking back on the making of my production of Satchmo, I now have a better understanding of what I set out to do. 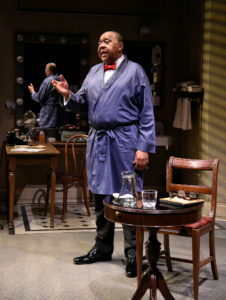 When Gordon Edelstein staged Satchmo at Shakespeare & Company in 2012, he opted for a mostly naturalistic production, enough so that Lee Savage, our set designer, sought out photographs of the Waldorf Astoria in 1971 and incorporated what he found there into the show. Not so Charles Newell, whose Court Theatre staging, performed on a minimalist set designed by John Culbert, was expressionistic and anti-realistic to the point of abstraction. Taking my cue from the play itself, in which a single actor performs three sharply contrasting roles, I opted for a third way, an approach that incorporated both naturalistic and anti-realistic elements. Working in the closest possible collaboration with Mike Amico, Kirk Bookman, and Matt Corey, who respectively designed the set, lighting, and sound, I endeavored to conjure up a nondescript backstage dressing room that looked recognizably “real” at first glance but would prove in practice to be a good deal more conceptually slippery. Louis Armstrong’s dressing-room table, for example, did double duty as Joe Glaser’s desk, and the not-so-solid back wall of the set was in fact a scrim on which we projected at unpredictable intervals an assortment of evocative images, just as Kirk’s brilliantly film-noirish lighting plot and Matt’s gorgeous original music and complex sound cues pulled the show away from straightforward naturalism. At the center of Collette Pollard’s set is a cramped, shabby tenement apartment identical to the one described in [Tennessee] Williams’ stage directions—except that the walls of the living room have been ripped away and are hanging askew in mid-air. Throughout the evening a stream of images related to the play is projected on these walls: words and phrases plucked from the script, “home movies” of the characters as seen in their youth, live close-ups of the actors that are shot by video cameras concealed on the set…. 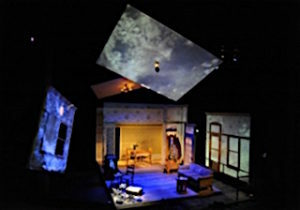 Kansas City Rep’s projections, designed by Jeffrey Cady, are astonishingly effective, not least because they are so tightly woven into Mr. Cromer’s conception of the play, in which the acting is as naturalistic as the setting is surreal…. It makes perfect sense that I should have had Cromer’s Glass Menagerie in the back of my mind, since I’ve always thought of Satchmo as a Menagerie-like memory play. 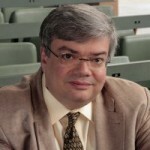 Yet it wasn’t until I gave a talk on Thursday to a group of Palm Beach Dramaworks patrons that I realized, and told them, that I must have been unconsciously groping all along toward a simplified version of his poetically heightened naturalism. To be sure, I also borrowed freely and without shame from Charlie and Gordon, that being what directors do: we are magpies who make use of all that we see and hear. I was privileged to watch both men working on their productions of Satchmo, which I admired equally and unreservedly, and I paid very close attention to how they worked. Seeing these two masters direct taught me how to do it myself. (I didn’t learn as much from Rus Blackwell, who staged the very first production of Satchmo, because I was far too preoccupied at the time with the script, which was still in need of extensive revision.) But as I look back on my own Palm Beach Dramaworks version, I recognize it as a staging chiefly influenced by Cromer, though I hope it also bears my personal stamp. And what might that be? When Bill Hirschman reviewed Satchmo over the weekend, he described my direction as “almost invisible.” He meant it as a compliment, and I happily received it as such. When I’m describing the staging of a show in the Journal, “transparent” ranks among the strongest words in my lexicon of praise. Regular readers of my reviews will know what I mean when I say that it’s not one I’ve ever had occasion to apply to the work of Ivo van Hove! 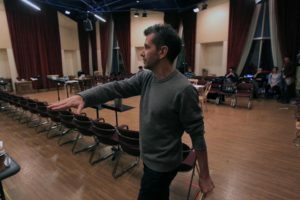 Sure, there are other, equally valid ways to stage a show, but should the day ever come when I can truly say that I have a directorial style of my own, I’d like for it to be so transparent that you can always see clearly through the production to the play, no matter who wrote it—myself included. I hasten to add, though, that one production does not a style make, much less another parallel career. I do think that Satchmo went well, but I know that I still have a long way to go before I can call myself a fully formed director, and that it won’t be until I direct a second show—preferably written by somebody else—that I’ll really start to see what, if anything, I have in me. As yet nobody’s asked me to do that, and it may well be that no one ever will. We have it on the best authority, after all, that you can’t always get what you want. Nevertheless, I’m already longing to try my hand again at the elusive, seductive art of stage direction, and I’ll be sorely disappointed if it turns out that I never get to do so. 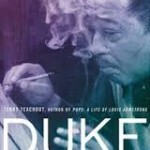 Having reluctantly left Satchmo behind in West Palm Beach, I know beyond doubt that once is not enough.